Fall continues to be a busy season for the WRN team, as we make stops in China, San Francisco, Eastern Canada and the United States in early November, followed by London, Frankfurt and Munich later in the month. 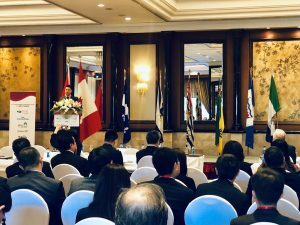 Chief Financial Officer Julien François is currently in China to present at the Canada Mining Investment Forums held in Beijing and Shanghai, hosted by the Canada China Business Council. Mr. François is also meeting with interested parties and Canadian Trade Commissioners during his time in China. WRN, along with the Yukon Mining Alliance, will be exhibiting at Booth #600 at the Silver and Gold Summit in San Francisco taking place on October 28th and 29th. Chris Donaldson will be presenting at 2:00 PM on Sunday, October 28th in the Resource Hall. He will also be available for one on one meetings both days of the conference. If you are attending the conference and would like to meet, please apply to take part in the one on one meetings in the Deal Room. Chris Donaldson will be attending the annual New Orleans Investment Conference next week. If you are attending the conference and would like and update on WRN, please contact us to arrange a time to meet. President & CEO Paul West-Sells and Chris Donaldson are planning an east coast roadshow the week of November 5th, aiming to hit Toronto, New York, Philadelphia and Denver to meet with investors and interested parties. If you are interested in setting up a meeting with WRN in any of these locations, please contact us. Western Copper and Gold and Casino Mining are proud to attend the annual Geoscience Forum in Whitehorse. Paul West-Sells and Mary Mioska, Sr. Environmental Manager will be attending the conference. Please visit us at Booth 1-5, on November 19th or 20th. Mr. West-Sells will be providing a corporate update at 10:45 AM on Sunday, November 18th. Mary Mioska will be doing a technical talk on Community-Based Assessment of Tailings Disposal Technology for the Casino Mine at 10:50 AM on Tuesday, November 20th. For the full event agenda, please click here. Chris Donaldson will be traveling to Europe next month for these highly attended events. Please visit the 121 London site and the Global Resources Conference site for detailed event information, and do not hesitate to contact us if you’d like to arrange a meeting with Mr. Donaldson.